WEARING yellow in the world's most prestigious bike race comes with prestige and perils. BMW has been at the front of the luxury large sports utility vehicle peloton for several years, and just like Tour de France leaders, the X5 has been under constant attack from a legion of rivals. Meeting the challenge is a revised line-up, which has recently been bolstered by the arrival of the two entry-level X5 models. A rear-wheel drive variant is available for just over $82,000 but we sampled the all-wheeler variant, which costs $5000 more. Impressive ambience and improved finishes mean there isn't much "base" about the xDrive25d. With a 26cm colour display central on the dash, leather trim and glossy surfaces, it certainly doesn't feel like the bare-bones offering. The chunky leather-clad steering wheel rises for entry and automatically drops once you are inside, for improved access. All the seats have a premium feel, although some extra support would be appreciated at the base. Space for five adults is assured, with excellent leg, knee, head and shoulder room across the rear pew. BMW has done a fine job with the latest iteration of iDrive, and it's easy to scroll through the various sections via the large circular controller. Shortcuts such as radio, sat nav and media make it quick to find the desired area - although the radio button can be obscured from the driver's side. This is something of a surprise packet. Power is relatively sedate at 160 kilowatts, but where it excels is the 450 newton metres of torque at next-to-nothing revs. With all that twist at the ready, rarely do you have any desire for more right-foot punch. You can choose between drive modes, including sport, comfort, sport+ and an economy function. The latter is most useful in the metropolitan area, and displays how many more kilometres you have gained from the tank by using the function that makes incremental improvements in accelration and cabin functions for better efficiency. Mated to an eight-speed automatic transmission, the pairing is rarely found wanting - in fact, it would be hard to fathom paying an extra $12,000 for the six-cylinder version if you had no intention of towing large boats or caravans, or planned to stay purely on the bitumen. But the X5 can, in fact, survive the rough stuff. 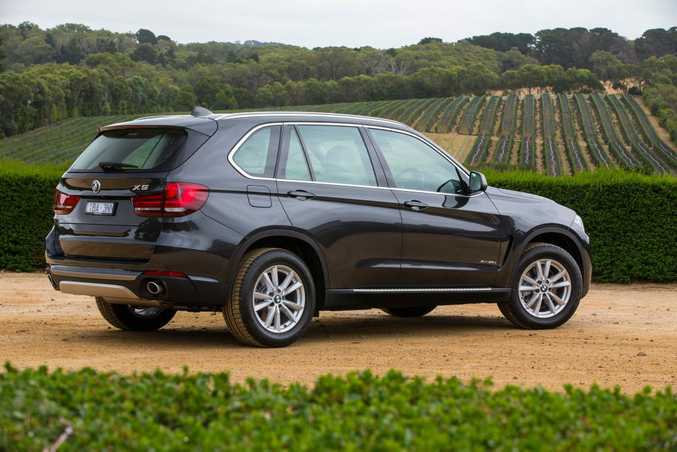 While you wouldn't want to tackle the Birdsville Track, it boasts some capable technology for off-roading - although we're pretty sure 99% of X5 buyers would never bother. You get push-button start, 18-inch alloys, cruise control with braking function, front and rear parking sensors, rear view camera, bi-xenon headlights, automatic wipers and lights, brushed aluminum trim, leather trim, dual zone air-con, power tailgate, Bluetooth audio and phone connectivity as well as USB/auxiliary inputs and sat nav. For anyone seeking individualisation, there's an array of options. You can upgrade just about everything, from a Bang & Olufsen surround sound system ($11,700) to 20-inch light alloys ($5100) or various interior and exterior packages. Also playing in the plush large SUV segment are the Audi Q7 3.0TDI ($90,500), Infiniti FX 36 GT ($76,400), Range Rover Sport TDV6 SE ($102,800), Lexus RX350 ($77,045), Porsche Macan S ($87,200) and Mercedes-Benz M350 ($99,045). Families and those with active lifestyles will love the BMW X5 cargo space. Making full use of the 40:20:40 split-fold rear seats, we managed to fit in two bikes without removing any wheels while one child seat remained in place. Also helpful is the two-part tailgate. It's especially handy when parked on an incline to save any gear falling out, while the power boot opening and closing function is a boon. Seven seats are an option, with the third row able to be installed for $4600. Cabin storage space is excellent, with two cup holders near the gear shifter, a massive centre console and space for bottles in each door. 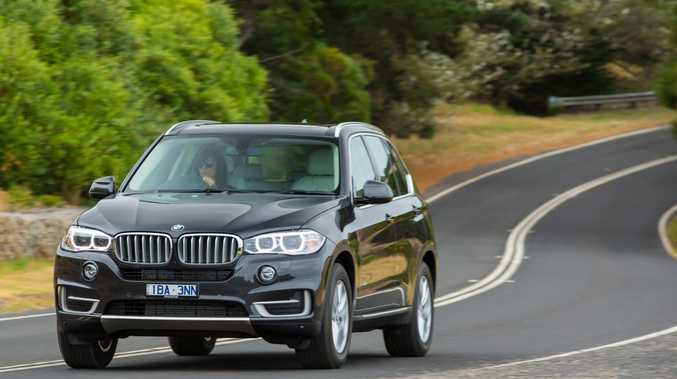 Given its size, the BMW X5 achieves astoundingly frugal fuel consumption figures from the 2.0-litre turbo diesel. We managed just over six litres for every 100km - slightly above the official number from BMW, but outstanding nonetheless. The marque is also working hard on addressing high maintenance costs, and you can opt for the pre-paid basic servicing package, which covers an annual vehicle check, oil change and labour costs for five years or 80,000km. Buyers can choose between "excellence" and "experience" exterior finishes. The excellence pack has more chrome finishes, while the experience line has aluminium and silver matt materials. Styling is still unmistakably X5, but you can spot this model over its predecessor via its broader kidney grille and new headlight design. It still has ample school car park cred. What we liked: Brilliant cargo area with automatic tailgate, great fuel economy from such a big car. What we'd like to see: Additional bolstering of seats, safety technology such as blind spot monitoring and automatic parking as standard. Warranty and servicing: Three-year unlimited kilometre warranty with roadside assist. BMW has condition-based servicing, but intervals are usually annually or 15,000km. Servicing packages are available which cover maintenance for five years or 80,000km, starting from $1290. Details: Five-door all-wheel drive large luxury sports utility vehicle. Engine: 2.0-litre four-cylinder twin turbo diesel generating maximum power of 160kW @ 4400rpm and peak torque of 450Nm @ 1500-2500rpm. Performance: 0-100kmh in 8.2 seconds. Bottom line plus on-roads: $87,900.